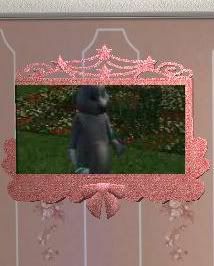 This is The Sims 3 Generations princess TV for The Sims 2. It's adjustable up and down the wall if you have the Apartment Life expansion pack with the use of the [ and ] keys. As with all the photos here, you can click the photo for a larger picture. Enjoy! I just downloaded this TV, and a bunch of other stuff from your site. It's really wonderful! I'm really excited about using it in my game. Things like this really keeps the game fun for me. Thanks!